An Uttar Pradesh police constable is earning praises from her seniors for helping an old woman she met on the road. Manvi saw an elderly lady outside a bank where she had gone for some personal work. On seeing the destitute woman, Manvi who is posted in Dhanghata area of Sant Kabir Nagar district comforted her, took her home and gave food. Her deeds went viral after Uttar Pradesh Police shared pictures of Manvi with the old woman on Twitter. Uttar Pradesh DGP OP Singh in a letter commending Manvi described her gesture as the "highest human virtues of kindness". Sharing the letter, UP Police took to Twitter saying, "DGP OP Singh commended Const. Manvi, in an appreciation letter, for exemplifying highest human virtues of kindness along with her duty. She not only empathetically comforted a hassled old lady outside a bank, helped her with her work but also offered her food. Congratulations Manvi!" Video of Assam Traffic Police Mithus Das Braving Heavy Rain and Storm During Duty Goes Viral. 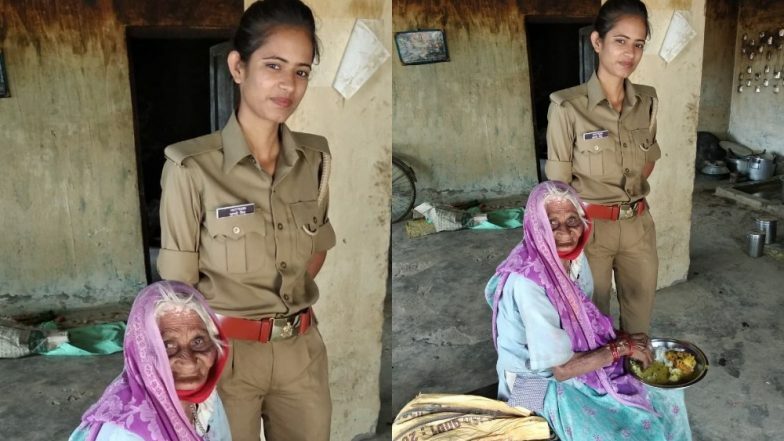 Uttar Pradesh's Hardoi police had shared a similar incident on Twitter where Priyanka Sharma, a constable helped an elderly woman in distress. The woman had said that she was hungry and needed money to go to her home. Priyanka then gave her food money for travelling. Both the stories are being shared widely on social media where the cops are being praised for their kind action. We hope these generous acts inspire people to help those in need.